← Happy Imbolc, St. Brigid’s Day, Candlemas, Groundhog Day. Arlen Wagner, son of a West Virginia undertaker, knows about death, but nothing prepares him for that midnight in the Belleau Wood when he sees a squadron of skeletons marching toward his position and understands that every one of those men is going to die. In the years after the first world war, Arlen relies on whisky and manual labor to try to live with his unwanted “talent” for seeing death before it strikes. In the summer of 1935, as Arlen and 19 year old Paul Brickhill, travel to a CCC camp in the Florida Keys, everyone on the train suddenly appears as a dead man. At the next stop, only Paul heeds Arlen’s warning to wait for the next train, and only Paul survives. That comment is not just meant to be facetious but points to one of the tactics Koryta uses to weave supernatural elements into his tale in a seamless fashion that is too often missing from the “urban fantasy” sub-genre that I once enjoyed but which soon became predictable. Koryta is a master of mood who plants the vision of dead men on a train among a wealth of ordinary details: the ever present heat, the smell of unwashed bodies, the cigarette smoke, the card games, and Arlen’s surreptitious sips from his flask. In the next moment, he can make a simple walk down an empty road in the dark of the tropical night burst with menace. He delivers on the promise of menace – and secrets. Everyone has secrets – layers of them. Arlen and Paul catch a ride with a man who takes them to The Cypress House, a roadhouse in the middle of nowhere, owned by a stunningly beautiful woman. A few minutes after their arrival, the man who gave them a ride tries to slip away, but is incinerated when a bomb explodes in his car. Why? Why are Arlen and Paul arrested for the crime? What secrets hide in the Cypress House – cypress house – another name for a coffin, Arlen remembers his father saying. The very best kind of coffin, the coffin of choice for ancient kings and for popes. Arlen’s father, who claimed he could talk to the dead. He was insane – wasn’t he? 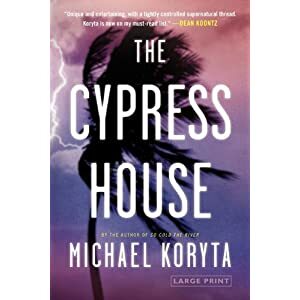 Michael Koryta, author of five mystery novels, charted a new direction by introducing supernatural elements into So Cold the River, which I praised on this blog last summer. The Cypress House just came out. Like its predecessor, this is one of those rare books I could not put down. This entry was posted in Authors, Novels and tagged authors, book reviews, horror, Michael Koryta, Novels, postaweek2011. Bookmark the permalink. After Arlen sees everyone on a train as dead, THEN things get strange? This isn’t exactly my kind of book, but I love the review.